Designed to supplement the Law 12 and Social Justice 12 curricula, this workshop explores how the Canadian Charter of Rights and Freedoms applies to our daily lives. PowerPlay is available in Metro Vancouver, and during select weeks of the year, in Kamloops and Nanaimo. Please note that youth workshops usually need to be booked at least a month in advance. This workshop explores the law, discrimination, and marginalization. Students are encouraged to critically examine social conventions and their own (mis)conceptions about equality. We use games and activities to start discussions about discrimination and its implications, and introduce the Charter of Rights and Freedoms and section 15 (the equality rights provision). Designed for Law 12 and Social Justice 12 classrooms, this curriculum provides tools that can be used by teachers to frame discussions around discrimination. There are also several follow-up activities based on important Canadian legal cases that illustrate key equality principles and can be used to continue the conversation. 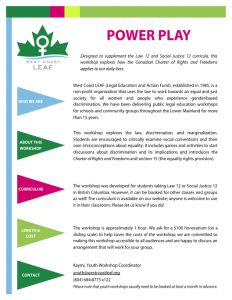 The workshop was developed for students taking Law 12 or Social Justice 12 in British Columbia but is suitable for any group interested in exploring the connection between social justice and the Charter. We are able to facilitate the workshop in Vancouver, but anyone is welcome to use the curriculum in their classroom. All of our youth workshops are delivered by our Youth Program Coordinator along with our volunteer youth facilitators. Our youth facilitators are between the ages of 18-24 and have undergone 21 hours of intensive training. The workshop is approximately 1 hour. We ask for a $100 honorarium (on a sliding scale) to help cover the costs of the workshop; we are committed to making this workshop accessible to all audiences and are happy to discuss an arrangement that will work for your group. Yes! Please email youth@westcoastleaf.org for more information. Please contact us at least a month before your desired workshop date.